I will be as sea crossing the Indian Ocean, stopping in Chagos, en route to either Seychelles or Madagascar, pirates depending. It is a 4, 000 miles. So i will be out of touch for two months. Wish me luck. Rest in peace, dear Widge. And blessed sailing to you, dear Jonah. The only sure way to know when it is time to leave is when you find your wallet empty and your galley stocked. This is my present condition. As I head north to the tip of Borneo I will look to the wind: If it is blowing an Easterly, I will head west 'about. If it is blowing a Westerly, I will head east 'about. Either way, I will eventually wind up at the bottom of Borneo and will pass through Indonesia to the open sea, at last catch a trade wind, my first in longer than I can remember, and I will sail for the Chagos Archepelago, which I had to pay an Outrageous fee to enter. But it is supposed to be fine and it is literally in my way, directly on route to my landfall in the Seychelles. I'd have to go around it. So I'm stopping, and paying, and diving at will. Untill I run out of water, food, or gasoline for the dinghy. My supplies are substantial, but it is a long trip, and I ain't planning on stopping in bali or Kuching, but who knows. Maybe i won't even leave. I've been talking about it for ages.
. . . but I do have 31 oranges, and that counts for a lot. My first memory of Widge was in my dormroom at Sewanee. He marched in, jumped right up on my bed, rolled over, did the J-stroke and demanded a bellyrub...I was so impressed!! Then you mentioned you were heading out for a hike to find squirrels. He jumped up, fast as lightning, darting from corner to corner of my room looking up at the ceiling because he just knew those squirrels were up there since you said "the word." We laughed for a good 10 minutes watching him "hunt" the squirrels in my room before heading out for a hike. hey there, i'd hoped that this day would never come but i knew that at some point i'd have to write you this email. widge slipped away from us last night in his sleep. i'd gotten a ticket to fly back home this week to say my goodbyes and was so sure he make it at least that long. the old man got the jump on me though. i had a sneaking feeling that when i said goodbye to him 3 weeks ago that it was the last time. he came full circle in a way though, and he's buried by the pond next to my folks' house at sewanee. he'd just taken a walk over there yesterday morning to go fishing with my dad, so he was enjoying life to the very end. jeremy and i were running a trail today that made me think of one of my favorite memories of him (out of so many favorite memories). it's 26 miles of trail straight through the chugach mountains and i have a picture of widge when we ran it together. he's running wide open way out in front of me with what i swear is a big smile on his face. and after so many miles that day and swimming a cold, cold glacial river, he still had enough energy to chase a moose at the end of the day. that dog covered a ridiculous number of miles. i can't even begin to estimate how many, and i know he enjoyed every single one of them. for a reason that i understand now i've been visiting the places up here that he loved the most these past few days. yesterday i was under a peak that i remember skiing with him four years ago. we got up to the top and i started skiing down and stopped to make sure he was coming too. he had flipped over on his back and was sliding headfirst down a steep slope. he buried himself in the snow of course, but managed to snorkel his way through it and catch up to me, tail wagging and ready to do it again. Thank you all for your thoughts and comments. I appreciate them all. Life in Kudat is great and I am enjoying the work and the anticipation of a good sail rapidly approaching. I don't remember why on earth I wanted a dog. I was a junior in highschool; the notion seems out of place with the time. I do know that I never imagined the real magnitude of the bond that we would share, or how profoundly I would be changed because of it. How many people say, "I am where I am because of my dog."? Well. . . I would. Widge was a chocolate lab. When he was born I imagined training him to be a good duck and dove dog. Hunting was my thing at the time. And I did train him this way, but I wasn't such a great dad in the beginning. I was finishing highschool and partying. He got Parvo and nearly died. How much did I notice?? My first year of college at Sewanee I had to leave him at home with Mom. My mom loved him and was pleased to have him. He was born with the same personality he would die with: laid back, unburdening, serene, communicative. He was not neurotic—give him a bellyrub and a dirty plate and he was happy. Our bond was built after my first year at Sewanee. I took a year off school to get my mind right. I was a boy growing up in the south. I wanted to do something different from the norm. I wanted to travel, do crazy stuff, have adventures. But I couldn't get any support. I couldn't even have a good dialogue that would nurture these sorts of sentiments. Widge was different (he was a dog after all); he was always keen to do anything that had to do with going places. He was a REMARKABLE road trip dog. He never complained, never whined or made me stop unnecessarily. He wanted to go and pee on foreign soil same as I did. Finally I had a partner, someone who would promote my dreams instead of quail at them. This is how he changed my life. It started with our first roadtrip out west to live in Jackson Hole. We rode mountain bikes in the Tetons. It continued on in climbing trips, of visiting friends or to our favorite destination, Montana.. He wanted to pee in every state of the Union. And he came close. Our last road trip was only a few years ago. Nothing had changed. Widge supported me in a time when I needed it the most—I wanted to choose a path. I was scared because it wasn't a well-worn one. Would I have had the courage to drive the miles alone?? You can't imagine—unless you are Jamie Blythe Wood—the comfort Widge gave me on untold nights in Montana. I was so so isolated. It was just me and Widge. I was happy, but without him the pendulum could have swung. After a short stent in Wyoming, we learned about the Appalachian Trail. He was three and a half; I was twenty. It sounded just like what we were trying to do: live simply, live naturally, be in nature. He had his misgivings about his pack at first, and he never approved of hiking in the rain, but all in all it was a dog's life. Squirrels hid behind each tree. Trail running would be his abiding past time until the end. Widge was popular with other hikers. He was well-mannered in the shelters and had the peculiar quirk of, as you slept, slowing pushing you off your sleeping mat so that you woke up sore, and he content. He had his own mat, but he particularly preferred Ridge Rests above all others. He chased squirrels all day long. We used to wonder what sorts of things Widge would see, as he was perpetually the first to go around the corner, and then back, then forward again and again and again. Back and forth, back and forth. We spent all day everyday together. He guarded me while I slept. He awaited me while I dined or shopped in town. We have too many stores from this time to share here. We returned to Sewanee after the AT, but this time together. I found a place to live off campus. I started rock climbing then and was completely addicted. This suited Widge well, because it meant we spent all day outside where there were squirrels and shade a'plenty. It was this year that we first met Jamie Blythe (now Wood) and we lived and climbed with her and Rob Fargason. They took Widge on many runs around the grounds when I was in class. So at this point in Widge's life he had gone from being a gun dog, to a horse riding dog (left this part out), to a trail dog, Frisbee dog, to a climbing dog. Now we are in Montana. We still get out in the woods same as always, but eventually I go back to school. Widge wouldn't stand for simply staying at home—and I wouldn't blame him. (At this time I had moved back to town). So he would run along side me as I biked to campus, staying on the sidewalks, heeling at cross-streets, otherwise chasing squirrels as we went. During the day he would lounge under a favorite tree stealing belly-rubs from freshman passers-by. He wasn't "always" there and ready to go when I came out of class—he had an agenda; I had to respect that. Small price to pay to keep him happy. I really didn't feel like his master; more like his brother. We shared. I rarely had to put my foot down about anything. We'd find some agreement in the middle. I was so proud of him. Our school time was special. He could do so much and do it safely. There was mad traffic on the way to school—and he is HORRIBLE with moving cars. And we never, ever had trouble. Even after the trip to school and back, we would still go out for an afternoon run to get a fresh breeze, Missoula sunset, and remember why we lived in Montana. These years in Montana were before and after Widge hiked the AT for the second time, this time with Jamie and Rob, my roommates in Montana and Tennessee. This was the beginning of a shift for me from being sole partner to Widge to a shared role with Jamie and her family. I sailing dreams were just beginning and I new they wouldn't please Widge at all. Yet Jamie's life was everything he loved, and more of it than I could have ever offered. Our goal was to keep Widge doing what he loved doing—this was more important that who he was doing it with. And he adored…adored Jamie. . . for good reason: she ran a lot, and gave numerous bellyrubs. He had lived with Jamie in Alabama and Idaho and become a true backcountry ski dog. Trail runs may be his bread and butter, but perhaps skiing was his dying passion. The dog loved snow. His smile was never so big as when bounding through a snow bank (maybe that was because his smile was the only bit of him visible above the powder!!). This was not a part of his life I shared with him nearly as much as I would have liked to. This chapter is all Jamie's. She and her roommates in Driggs Idaho were in the backcountry relentlessly. And later it would be Jamie and her husband Jeremy skiing in Washington and Alaska. Mind you, Widge was starting to get some years now, seven, eight years old, no mere pup. And he had to keep up with the best athlete's I know. They'd do twenty mile runs and Widge would do his standard up and back, up and back routine. . . how many miles is that?? I won't even think about the skiing miles. I know he never looked so fit as he did after his first winter in Driggs Idaho. Jamie is from a farm near Huntsville Alabama and goes back there regularly to help her dad, Jimmy with the crops. Widge always came along and loved chasing the Blythe's cows around. When Jeremy went into medical school, it wasn't always possible for them to have pets in their housing, so Widge would stay on the farm with Jimmy. In a way, these were the beginning stages of Widge's retirement. Maybe at first they were vacations from the pace of western mountain living, but as he finally accepted old age—by which I mean twelve plus years old—the shady life on the farm suited him well. Jimmy and Widge would ride around in the truck or gator and feed the cows (Widge was now a little too slow to safely outmaneuver the mama cows, so he stayed in the cab). They'd go fishing down at the pond. At some point in the years together, Betty Barton, Jamie's mom, relented on the steadfast rule: No Dogs in the House. Now Widge could escape the affections of the younger dogs—the one thing that always seemed to annoy Widge, puppies. Never had much patience for them. He resumed one of his favorite roles: that of kitchen floor mat. Widge died in his sleep the there. Well, not exactly there on the farm, but in the Blythe's home at Sewanee, where they split their time. I am oddly proud that Widge rests there. I am happy to have part of myself tied to Sewanee in more than memory. Widge rests by the pond where he and Jimmy had been fishing just the day before. There is hardly a more tranquil, serene place in the world that the Cumberland Plateau to rest in peace. I remember Widge always smiling, eating ice cream off Matt DiFranchesa's spoon in ID—Gandi boosting that Widge had been unable to wrest his mat from him during the night while on the AT—the story Rob and Jamie told me about the baby squirrel that fell onto the Trail just in front of Widge. . . and he panicked, didn't know what to do, there was no chase, and the squirrel got away—I remember teaching him how to be a Frisbee dog—bringing him to class in Snowden Hall at Sewanee—the time he got skunked in Arizona while we were on a climbing trip, how he rolled and rolled and rolled in the pine straw to get the stink out, and how it worked!—the time when Molly and Luke Nemeth took him on a drive in an Aspen blizzard and let him out of the car while they went to the grocery, only to find him gone when they came out. They looked for over an hour for him to no avail. . . .only to find him at the front door when they came home, miles away. They never mentioned this to me for years. How did he find his way? ?—Same story in Missoula, found his way to Heidi's house in a white out when he had no bearings what-so-ever.—the time he and Karma (roommate's husky) got themselves stuck up on a high mountain ridge in the Mission Mountains and I had to go up—again—to rescue them. Idiots.—The story Aderly told me about the summer she looked after Widge and her roommate had descretely made a chocolate cake, and Widge broke into her room and ate the whole thing, and therefore everyone found out about the cake—I remember him getting chased down the Trail by a crazy raccoon—I remember waking up to Widge whining, only to see scores of cow legs surrounding me on all sides in Wyoming.—I remember Widge whining seemingly without reason for the ten minutes before I wrecked the Explorer on I-90 on black ice. He knew.—I remember Rob and Jamie finding Widge's lost backpack two feet beneath the snow when Jamie had put a ski pole onto it and Rob saw the red through the hole in the snow. And this was miles away in the backcountry and not even on a true trail. Amazing. And I remember Widge getting head-butted by a goat in Virgina, one of the most hilarious things I've ever seen. Not sure why.—I remember tolerating his extreme pleasure while driving through Yellowstone Nat. Park, as Jamie can attest to. One of the few places where he can really not control himself. The elk and moose galore were more than his senses could stand. This is an abbreviation of the life of Widge. Jamie could no doubt write as much and more. Jamie and Jeremy and Jimmy shared as much of Widge's life as I did. Weren't we the lucky one's?? Yet we all deserve some credit for providing so much for a dog we loved so well. He was never kenneled, lock-up, leashed, fenced, fattened up, or, most notably, left behind. He was as impassioned as any person I know. And think about this: He did all that stuff in a mere fifteen years?. . . makes me feel lazy. Leaving for banggi Island, then Sandakan, then up the Kinibatangan River, then to Sipoden Island, then all the way back around to Kuching on the SW side of Malaysia. Then off for Chagos, Seychelles, and Mombasa. I have crew. Life is Good!!! Explanation will come. . . eventually. We are currently gearing up to go sailing. Yea, believe it or not. Sailing....who knew??? The island of Borneo is controlled by three countries: Brunei, Indonesia, and Malaysia. Brunei is a small oil-rich nation, something like Kuwait. Indonesia on the other hand is one of the two largest archipelagoes in S.E. Asia, with the Philippines, and spans all the way from Thailand to Papua New Guinea. When I imagined landing in Borneo, I thought of National Geographic head-hunters, poisoned darts, and sweltering jungle. Reality is always a touch more complicated than dream. I landing in Malaysia, a wealthier country by far than the Philippines. The infrastructure—water, roads, buildings—is so far superior as to not be a just comparison. At first, I thought perhaps it was a local difference, as Kudat, where I am now anchored, is but one town. But as I have gotten to travel in the last week I have seen that the difference is endemic. The sweltering heat is still present, but the jungles have been ravaged by logging and many of the forest people of old are now civilized. Malaysia makes up only a small portion of Borneo, most of the west coast, where central and eastern Borneo are Indonesian. It is the central part of the island that is most likely still natural and traditional. I packed a rucksack with the plan of getting away from Brillig for a few days. Her little anchorage is snug and safe and there is a famous mountain in Borneo called Kinabalu. It is the tallest point between the Himalayas and Irian Jawa. The mountain is 4101 meters (13,434 ft). It is a huge granite dome rising out of the jungle lowlands. It is steep, but short to climb. I arrived in the late afternoon—no reservations. The lady said that I could have a room, but all climbing permits had been issued. After a bit of talking, she said that if there was a cancellation, I could be first on the waiting list. The park itself is huge, the size roughly of Singapore. I went down to my dorm and laced up my running shoes. The weather was amazingly cool, now at 1500 meters. The air was humid, lots of running water and lush forests. The insect noise was incredible. I had never noticed before just how far behind insects are compared with birds in the arts of melody and rhythm. I have never heard such awful music makers. You could here beginners: a rhythmic beep…beep…beep… . . and then the rhythm would falter, he’d stutter, almost cough and try to keep going. It was almost comic. And then there was another insect that sounded like a lumber mill. Loud, unrhythmic, high-pitched. . . no elegance or style what-so-ever. By the time I finished running there had been a cancellation and I was set to climb in the morning. Side note: As I washed up that night, the bathroom was full of the most amazing diversity of moths I have ever seen. Out of thirty or more moths pasted on the walls or flying about the lights—not one was similar to the next. It was amazing. They were all beautiful and well colored, large and small, discrete and flamboyant. In the morning, once the numerous formalities are fulfilled, my guide and myself set off for the mountain summit. I don’t know how long it has been since I climbed a tall mountain, or the last time I really had to feel good, old-fashioned physical pain, but I was beaming with pleasure. I felt like I was flying up the mountain. My steps were small, but I didn’t stop, and we were making good way. 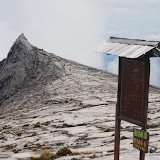 Normally a hike begins at 8 am and ends at Laban Rata, the high mountain hut around 2 – 4 pm. Most people wake early in the morning, say 3:30am to finish the climb in the dark and see the sunrise from the summit. They then descend to Laban Rata, have some breakfast and then head down the mountain. This is what I had planned also, but we made such good time, and the day was exceptionally beautiful—a bit of a rarity on a mountain—that we considered a new plan. We made Laban Rata by 11:30am. That gave us enough time for a lunch and a break, before pushing on up the mountain in the afternoon. We had time, the weather was perfect, and I felt so damn good to be hiking up a properly steep hill again I was too high to think about stopping. The climb was like a never-ending staircase, sometimes more like a ladder. The distance is only 12k!! Above Laban Rata though, the shrubs thinned and the granite became the dominant physical feature of the trail. Fixed lines were bolted in place as the path met blank rock faces. Mind you, this trail is hiked by a Tremendous amount of people, people of all ages and fitness levels. It is strenuous, and I found it so impressive that so many people had the determination to see it through. By the time I was ascending, most everyone was down to Laban Rata. No sunrise, just clouds. No people. We climbed up and up and not a soul was on the mountain. Imagine a Mt Washington, or a Mt Rainer with no people!! Clouds came and went and the granite spires unveiled to our left and right. I could only think of the Alps or the Sierra Nevadas. The grade was far lessened now, just a great spreading dome of granite. I wanted to run and climb each spire. I can’t remember the last time my whole body felt so good. Indeed my legs were trembling at this point, but my smile encompassed my entire body. We reached the summit at 2pm. Instead of the cold hikers are warned about (in the morning), we found sun and warmth. I took off my shirt, ate some chocolate and smoked one of Walter’s (my guide’s) cigarette’s. Although we had reached the top, had plenty of time to relax there in the sun, I was already thinking of something else: Salt Peak. Salt Peak was the most prominent spire that we passed on our way up. Gorgeous is hardly the word. Perfect. I felt the backside of it had a climbable route on it. And I wouldn’t head down until I found out. Walter had been a great guide. It wasn’t normal to pass all the rest huts on the way up, or to climb the peak in the day. He had also let me get off route and do some scrambling on the way to the summit. This all to say that he had grown in his trust of me and my comfort on the mountain. So I felt this would help his “unease” when I set off for Salt Peak instead of down the mountain. The granite dome was an ideal inclined for a downhill run. So we blistered it out. I had a fair lead on Walter and used it to follow the ridge for Salt Peak. As I stemmed my way up the granite to the summit he wasn’t mad. He even got my camera out of my pack and clicked a couple of pictures (to close to be any good). I made a slow descend after one of the great vistas of my life: nothing but granite stretching across miles. All green jungle beneath. We sat again and laughed at such a fair day on the mountain, how rare to be here alone. We shouldered our packs and started our jog back down the mountain. We reached Laban Rata in 45 minutes, beat. I sat on the porch, drinking tea profusely, and watched the sunset behind the mountain. In the morning, everyone left for the summit. I slept in until 7:30, ate some breakfast, and was gearing up to leave as people started trickling down the hill. I was stiff and weak starting out, but with a little prodding from Walter (another race???) we started gaining speed. It was a rock-hopping, stair-running scramble. We even picked up a local photographer and guide as we went. The photographer later left us in the dust. At some point, you just can’t stop. You come so far you simply want to see it through to the end. I was so tired but had to push through to the end. At the end was a short uphill section of stairs. I meekly started to run up it, yelling “race” to Walter, who promptly bounded up the stairs like a gazelle, showing me just how much reserve he really had. We were down in an hour and a half and the first ones off the mountain that day. 10:30am. Say some goodbyes to Walter, walk out of the park and immediately catch a bus heading for Sepilok, the orang-utan sanctuary. In Malasian, orang-utan means “people of the forest” and they are the only native ape to S. E. Asia, living on Borneo and Sumatra. The logging has had effects on the orang-utan population and Sepilok is one of only four rehabilitation centers in the world. On our boat trips we saw proboscis monkeys, maquaks (another sort of monkey), kingfishers, hornbills, fish eagles, monitor lizards, gibbons, crocodiles (small ones), flying foxes (the world’s largest bat), and endless other marvels. No pythons; no elephants, no rhinoceros—which at one point in time was possible to see along the river. It was a comfortable trip. I could sit around—my legs were weak; stairs were a strain. But I enjoyed the company and the boat rides. The animals were always a bit in the distance, mostly in the trees, so I wasn’t as interested as many others. I saw dark dots mostly. But the orang-utans were really special. I’ve never seen an ape before. He was huge, cinnamon brown, and those amazing long arms. We caught one high in a tree once and watching him work his way down was something I won’t forget. The advantage to going to Sepilok would have been the proximity: being able to see their faces and expressions. I didn’t get that. But I did see orang-utans in the wild. I have friends who have taken their boats up the Kinabatangan River. This would be an amazing experience. I am not going to take the time in Malaysia to do such a thing, though this is the sort of adventure I hope to do in the future. I have a friend coming in a few days and I hope to do some interesting trips with her. There are a few good diving islands around the west side of Borneo and Sulawesi. We will stop there on our way to Bali. Bali however is not a pleasure stop. We will only be granted three days there without a visa—so it is a provision stop before crossing the Indian Ocean to Seychelles, an archipelago north of Madagascar. Since I was back home in the States, it was a long crossing that I most looked forward to, and now it is finally approaching. There are still hurdles; the boat must be ready. But I don’t see anything critical blocking a crossing this season. Once I’m in East Africa I can slow down again. In the Kinabatangan, I heard the praises of Madagascar sung over and over again. The ecology there is apparently surreal, being separated from the African continent for over 80 million years. So I am getting excited. And, of course, in East Africa, there are two large mountains to climb. My former addiction is rekindled, I hope to never have it quenched again.